Does your company use heat? Do you carry your own water? Do you recycle the waste water? Are you able to work in remote locations? What makes you different from any other power washing company? 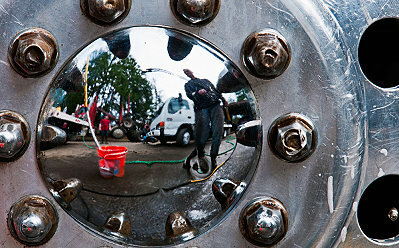 Do you use acid when washing Semi Trucks? How do you estimate the cost of service? Yes, we have the ability to use heat on request. Heated pressure washing is an important part of our sanitation services. We also like to use heat for uneven surfaces or hard to reach areas. We can carry up to 600 gallons of water. Yes, we can recycle the waste water. We will remove as much water as is necessary to ensure that you were unaware that we were ever there. Yes, we can access remote locations easily. We will arrive on time for the job 100% of the time no matter the weather. We use a 4x4 truck to haul our equipment. Rain, sleet and snow will not stop us. We give 100% to every job. The job is never finished until you are satisfied. We do the extra little things that make the customer happy. We really pay attention to detail. Not only do we clean the outside of the fleet trucks, but we wipe down the dashboards and clean the inside windows. If we wash off a sidewalk, we remove all the debris off the premises. We wash the old fashioned way with soap, water and a mitt. At our customers request, we will use acid if necessary. How do you estimate the cost of your services? For Fleet services we charge by the truck. All other services are billed by the hour. We service the all of Portland Metro area and Vancouver. 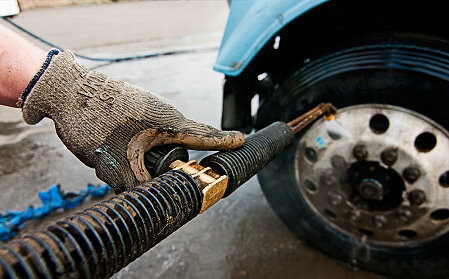 We do service areas such as Beaverton, Hillsboro and Silverton. We are a 24 hour business. We work around our customers schedules. It does not matter if it is 4 am or 11pm. We will be on the jobsite when you need us and on time. Copyright 2011 Calvin Power Washing - Ross Calvin. All Rights Reserved.